This week we have the wisdom of the Gooseberry come out to join us. I personally, love Gooseberry’s, I now have 3 plants growing in my front vegetable bed and I hope for some fruit this year. Two of them are special to me, for the person that gave them to me is no longer walking this earth. Rest in peace, Aunt Catherine: I shall always think of you when I see those bushes and this year, I hope for some fruit! It is interesting that the Gooseberry card in this deck indicates that I have permission and the right to draw on the collective wisdom of those who have walked this path before me, especially if you’re a traditional Shaman. I’m not a traditional Witch, let alone a Shaman and beyond using the ripe green goose-gogs for jam in the autumn / fall, I don’t know too much about this plant. Reading further into the book, it says that the fruit from gooseberry’s helped ease women in labour (I wonder how?! ), so helping to form its traditional association with childbirth. Really? New one on me! I’ve heard of pineapple bringing on labour, as well as the act from which a child is made, but not gooseberry’s for helping with the pain. 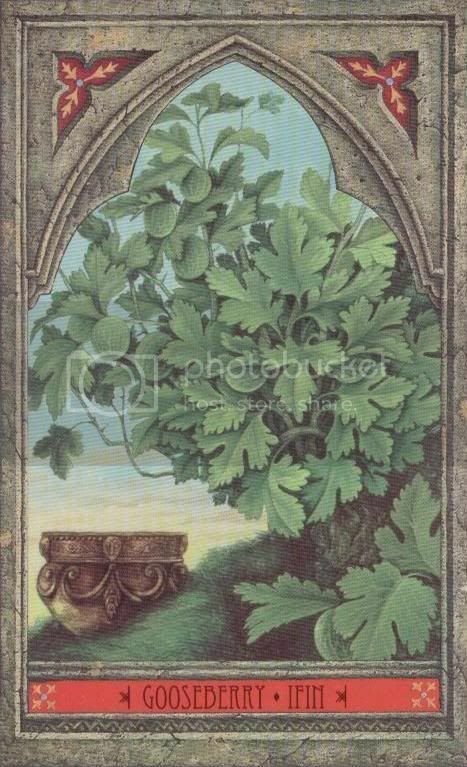 It makes sense then that the Gooseberry bush is sacred to a few Goddesses who are associated with childbirth, particularly Brigit and the Roman Goddess Juno, the mother of the gods. I always think of the phrase: We found you under a gooseberry bush! A wee rhyme I was often told when I was young when I asked my parents were I came from: too young to know the truth but old enough to understand I was once a baby and I was not any longer. Gooseberry bushes as I said above, are linked with ancestral lore, so this would tie in with the birthing connection: you bring the heritage of the ancestors to the newborn infant. But what I do not get is: how. Do you plant a new gooseberry plant when a new child is born? Or do you give the mother gooseberry jam on toast, to help her recover? If like me, you think it might just be both, do go for it! So this week, look for the connection to the ancients. My gooseberry bushes are budding now, the two from Catherine are more advanced than the black gooseberry bush, but still, there is life growing there, the ancient knowledge is there to be tapped into. Just, darned if I can work out how to use it. Pregnancy and childbirth aren’t an option this week!